Well, I've been burrowed in here in Colorado ever since I returned from Christmas vacation. Writing away busily, as I've shared with all of you. But, now. . .the Traveling Muse is beckoning me out of my snug little writer's burrow and back into the busy traveling scene once again. Airports, rental cars, freeways, hotels, conferences, readers, writers, and books, books, and books. Lots of books. Wednesday morning, March 28th, I drive away from my driveway to the Transit Center here in Fort Collins, located close to I-25. I'll park my faithful old Explorer, Pearl, in their free long-time parking lot-- -yes, you heard right, I said free---and take the shuttle to Denver's International Airport and fly off to Sacramento, CA. I'll be spending the first day of the trip with an old friend who grew up and now lives in Sacramento. I'm attending Left Coast Crime, a great mystery conference for fans, readers, and writers of all things mysterious. It begins Thursday, March 29th and runs through Sunday, April 1st, at lunch. I'll be returning home on Sunday. I'm on two separate panels---one on cozy mysteries on Thursday afternoon and the other on Settings as Character on Friday morning. So----for any of you who live in the Sacramento area and would like to stop by and say 'hello,' simply email me at maggie at maggiesefton dot com. I've already had an email from anot her devoted reader of the Kelly Flynn Knitting Mysteries who is bringing three of her other mystery-loving friends and meeting me for lunch on Saturday, March 31st. I'm excited to meet them. If you'd like to drop by and say "hi" or have a cup of coffee or a drink at the bar, simply email me. 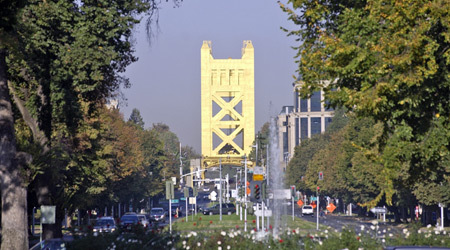 The conference is being held in Downtown Sacramento at the Sheraton Grand. So, I'll be there during the daytime and some nights as well. But I'm staying at a Best Western two blocks away. It's a great way to see some of your favorite mystery authors 'in the flesh." Come on down! I wish you lots of fun Maggie! That's awesome Maggie. We don't get many mystery writer events around here. I live in the Sacramento area and will get more info on this event and try to make it. I hadn't heard about it, so I have a couple things scheduled but I definitely want to make time to get by. Hope to see you there. Jealous that you're heading to my favorite state!! I'll be at LCC, too! It's my first time and I'm already nervous about being a noob. Good thing I like to laugh at myself. I'll check out your panels. I'm on one on Saturday - Private Eyes: They're Watching You. Which is pretty funny, since I think my every answer to every question is going to be, "I make stuff up. It's fiction." Aurian & Chris---Thanks for the good wishes! Lynda---Left Coast Crime is a mystery conference, so it does charge a registration fee. But, anyone is free to come to the hotel lobby or restaurant and bar. And you'd probably see writers you've read in the bar and/or restaurant. :) I'm assuming there's a coffee shop there, too. I plan to make good use of that. Send me an email and let me know if you're stopping by the hotel, and we can meet for coffee or drink. Liz---Did you grow up there or is it simply your favorite place to visit? Hey, Gayle---Definitely email me and and we can meet for coffee. My first panel is Thursday afternoon & next is Friday morning. I hope you are having fun at the conference Maggie!